Today it was my turn to do the tutorial on the Speedy TV Tutorial Time challenge. This is one of my favorite techniques -- Pillow Top. I actually had a tutorial for this technique on my blog back in July of 2013. But it also appears in the Tutorial Section of Speedy TV. I've used this technique many times. Here's my card for today, using one of my favorite colors and flower images. 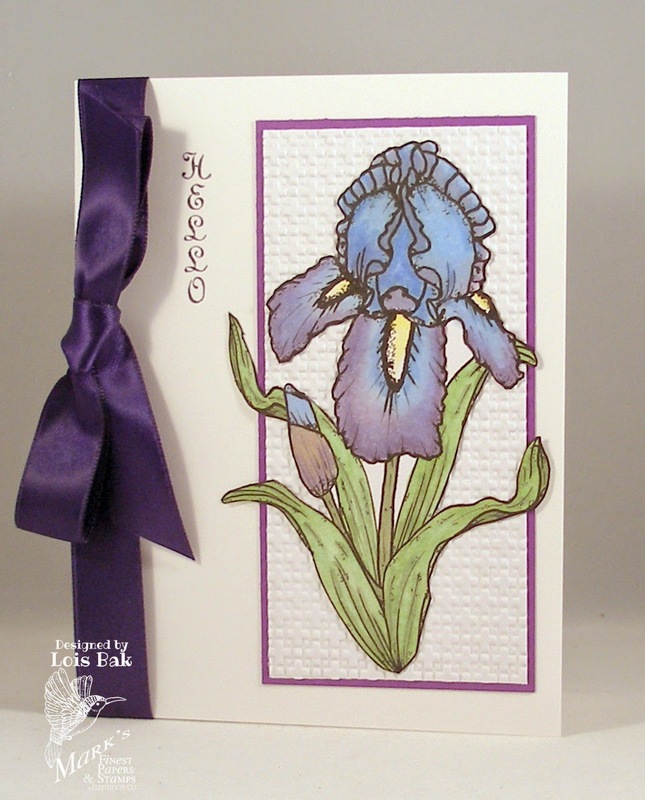 A few weeks ago I made a similar card to this one -- but it has a few more frills on it -- sort of More is More! I hope you'll give this technique a try -- and link your card up on Speedy TV. 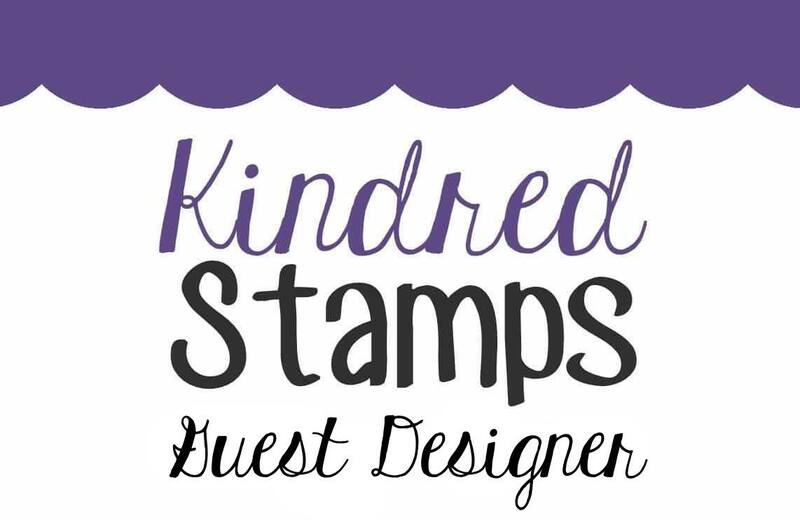 You might win a free stamp set. 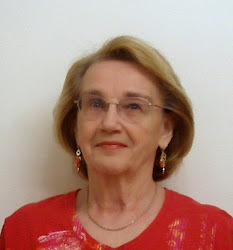 Frances is ending her month as hostess of the CCEE Stampers Blog with an interesting challenge -- Number It! We were to include a number somewhere on our card. I took the opportunity to make an anniversary card for good friends of mine who are celebrating their 50th anniversary this year. 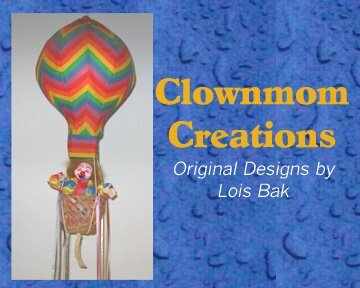 I used a fun fold technique called a Building Block Card to create my card. We'd love for you to play along with us. 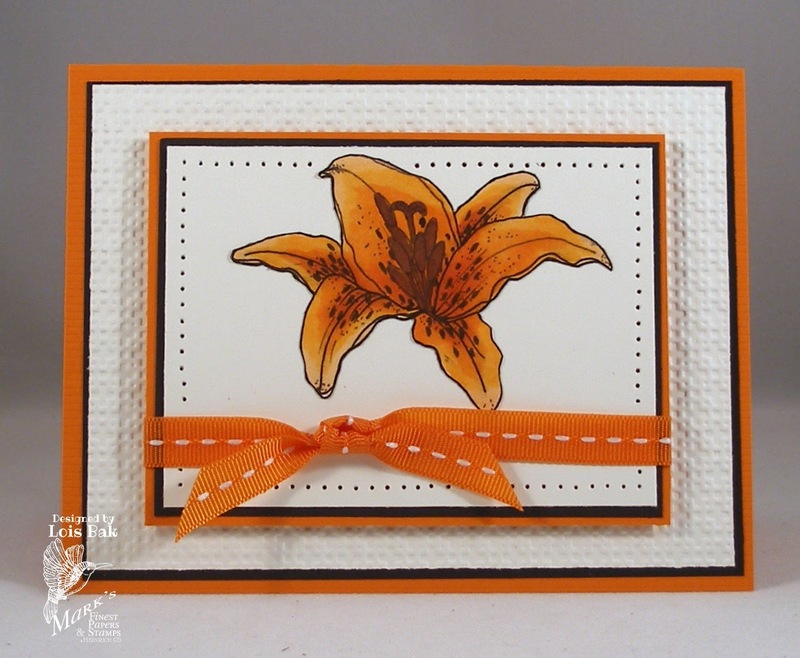 Just link up your card at the CCEE Stampers blog. 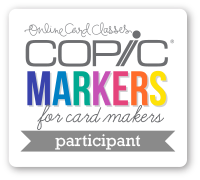 If you upload your card to another site, such as Splitcoaststampers, be sure to add the keyword CCEE1422. Today's Tutorial Time challenge on Speedy TV shows how you can get some depth on a one- or two-layer card. It's called Masked Borders, and here's a link to Barbie Dobson's tutorial. 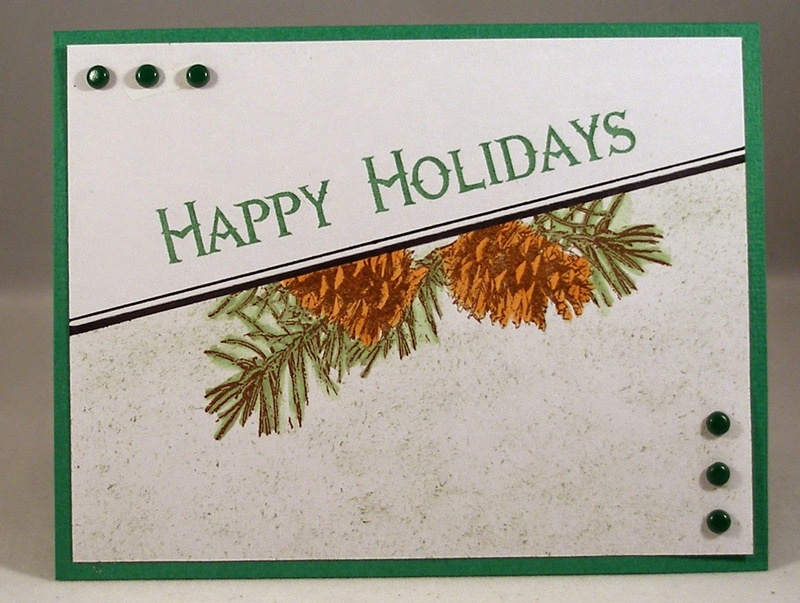 My card is a relatively clean-and-simple Christmas card. After doing all my stamping and coloring, I stippled some green ink on the bottom section to get some more texture. If you've never done this technique, we'd love for you to give it a try. Be sure to link up your card at the end of the challenge post on Speedy TV. 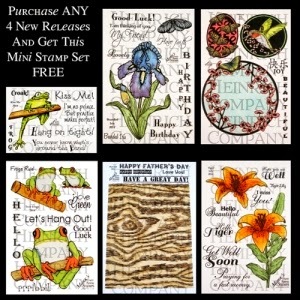 You might win a free stamp set. 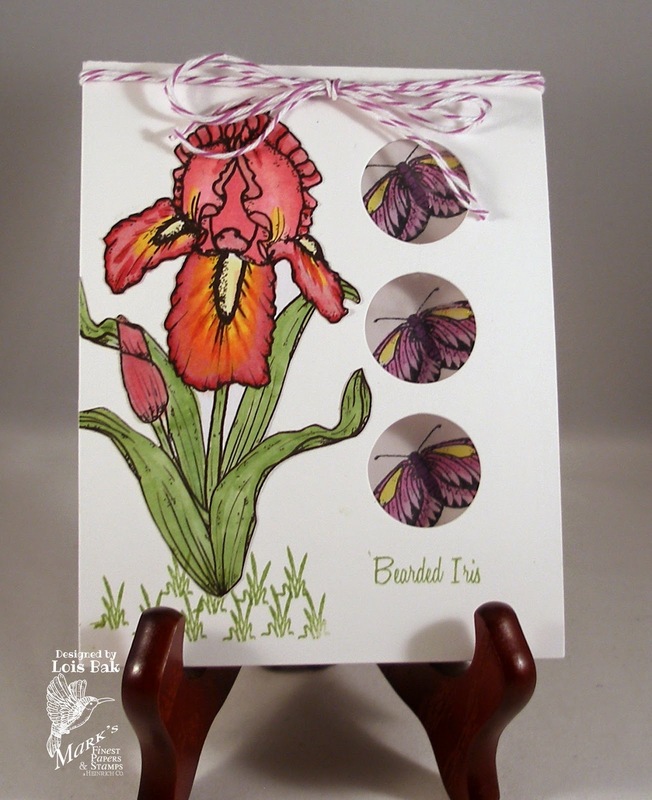 Today's CCEE Stampers challenge is to make a project using acetate. There are a great many ways to incorporate acetate on your projects. The one I chose was to make a window in a Halloween bag. I stuck a cupcake in my bag and made a matching card. If you'd like to join in on the fun, pull out your acetate and find a project to make. 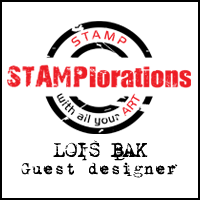 We'd love to see what you did, so link your project up at the end of the post on the CCEE Stampers Blog. commenting is 10 PM EST on Friday, May 16, 2014. Here it is -- Friday already, the last day of this month's Blog Hop. Again I'm not an official part of the hop, but I'm glad you stopped by to see my cards today. 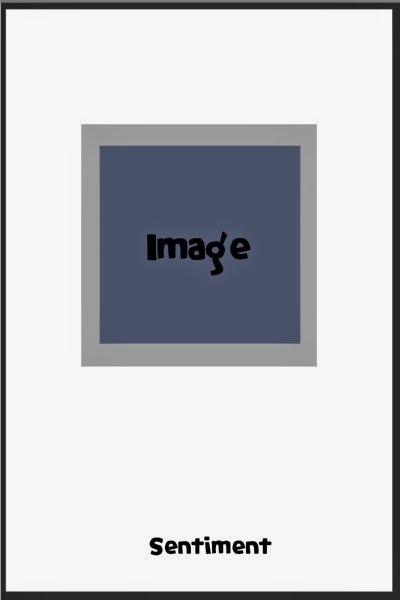 The SWAT challenge that I chose for today is challenge #46, but I rotated the layout. In addition to rotating the layout, I also elongated the focal panel to accommodate my iris. The twist was to use nature's colors. If I'm making a card of a natural-growing plant, does that make my colors "nature's"? I hope so! 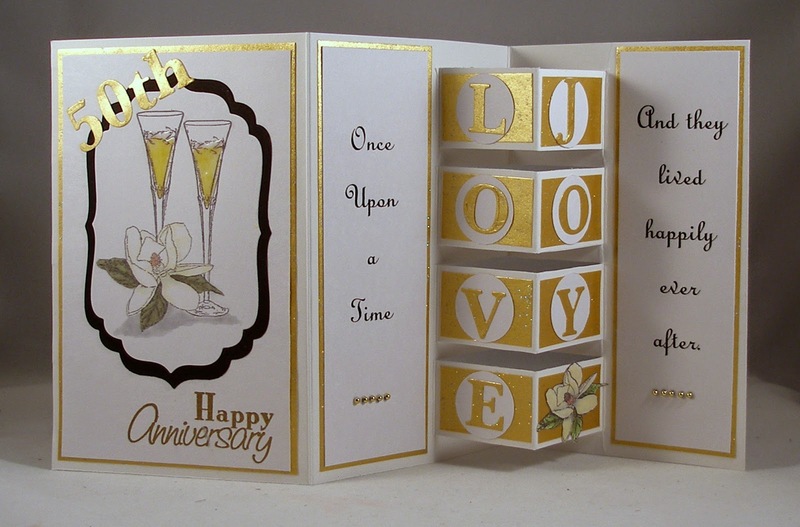 For my second card I used a Sizzix Movers & Shapers die to cut my card base. 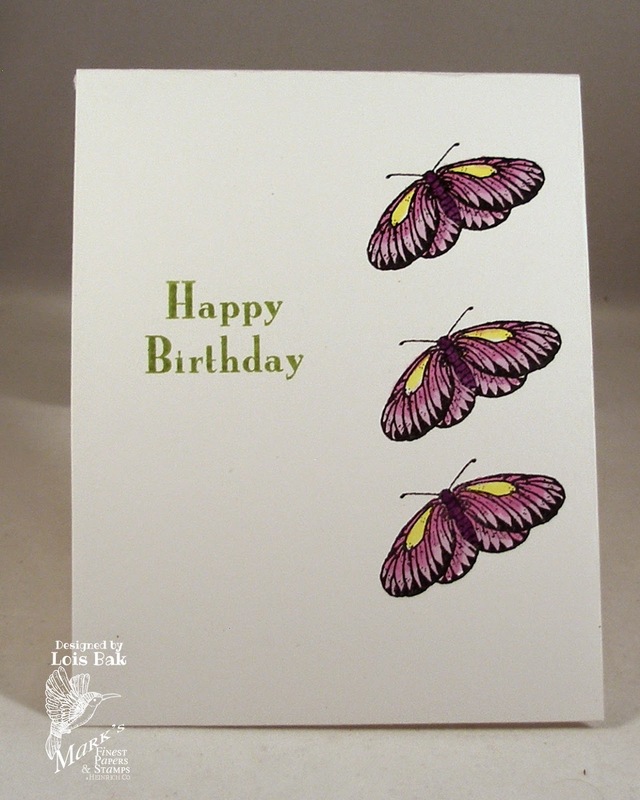 I strategically stamped the butterflies on the inside so that they show through the three circles, which are backed by a small acetate sheet. The color of my iris is more purple IRL. 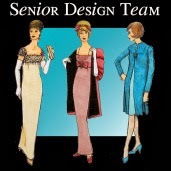 I hope you've gotten lots of inspiration from all the design team members this week. We sure had fun showing off this month's sets. This week's Tutorial Time challenge was rather fun -- use old jewelry or watch parts on your card. My "parts" actually came from a small ceramic clock (a bit larger than a watch, but I think it will still count) my mom had made at least 25 years ago. I still have the ceramic clock, but the "innards" stopped working a long time ago! 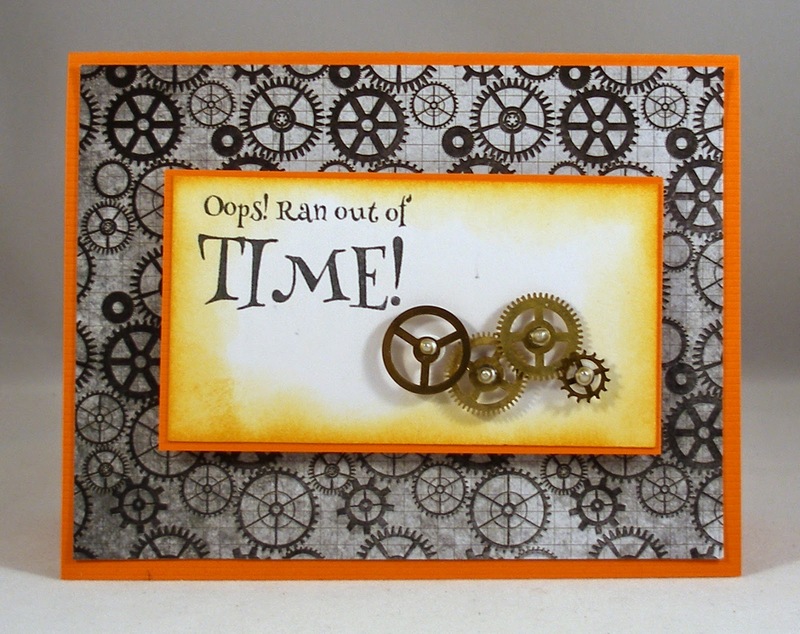 I used some of the cogs and gears on my card. 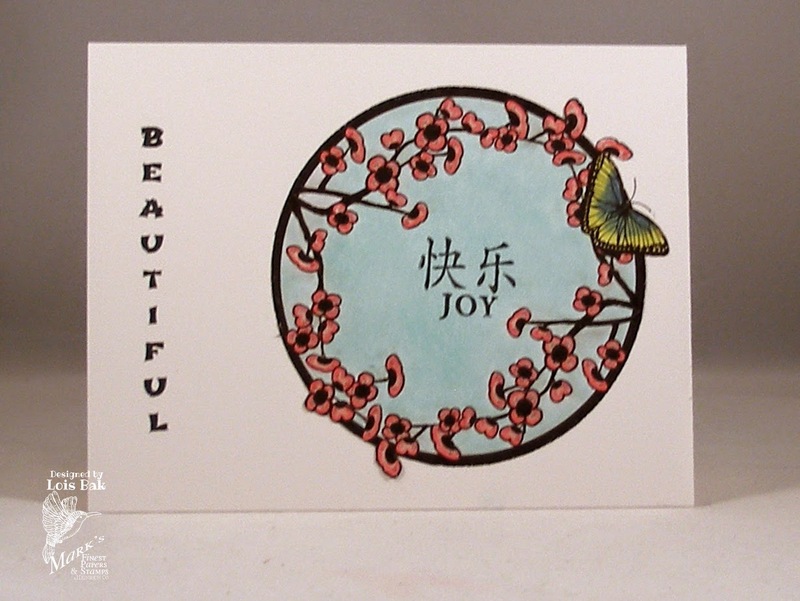 The sentiment is from a fun mini stamp set called Out of Time. Inside I stamped the sentiment "Happy Belated Birthday." If you've got some old jewelry or watch parts and don't know what to do with them, here's a link to Cheryl's tutorial. 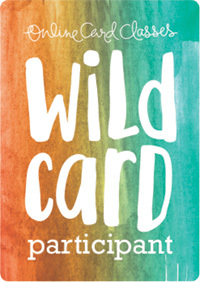 Link your card up on the challenge post at Speedy TV, and you might win a free stamp set. I've got lots to show you again today. 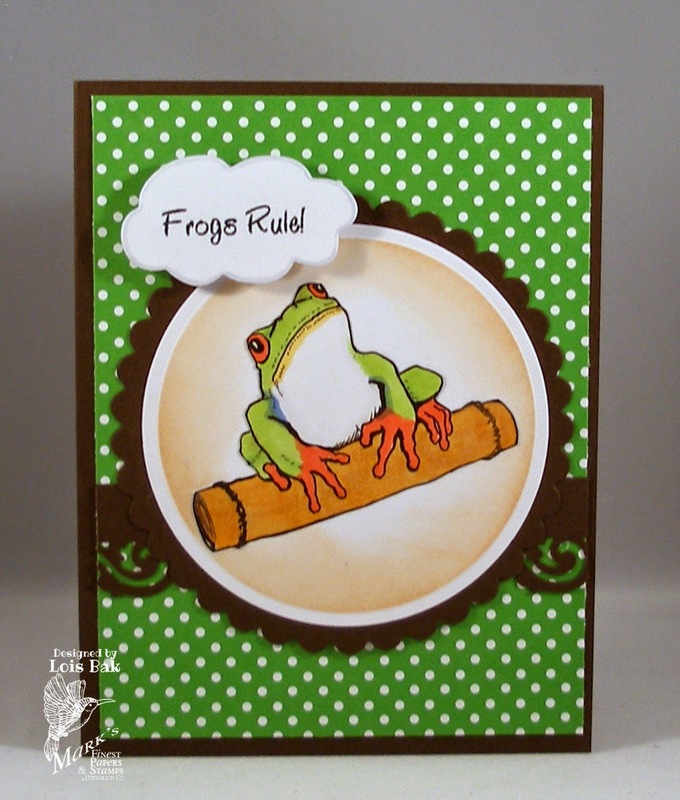 My first card today is for both the MFP Blog Hop and the CCEE Stampers blog challenge. Frances Byrne gave the CCEE Stampers a layout to use for today. 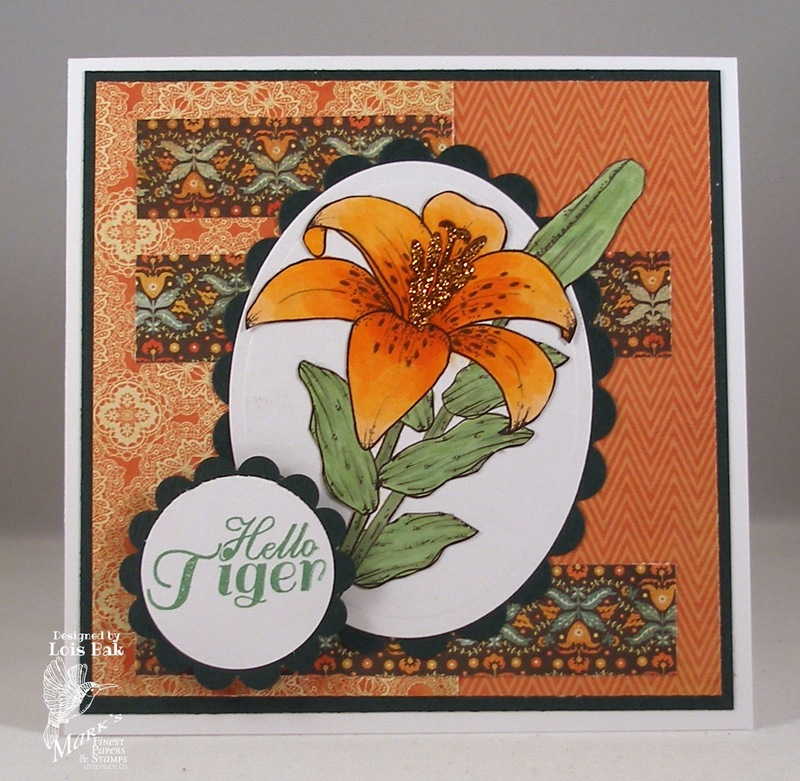 I used the larger of the two tiger lilies from today's set and some pretty MME patterned paper. 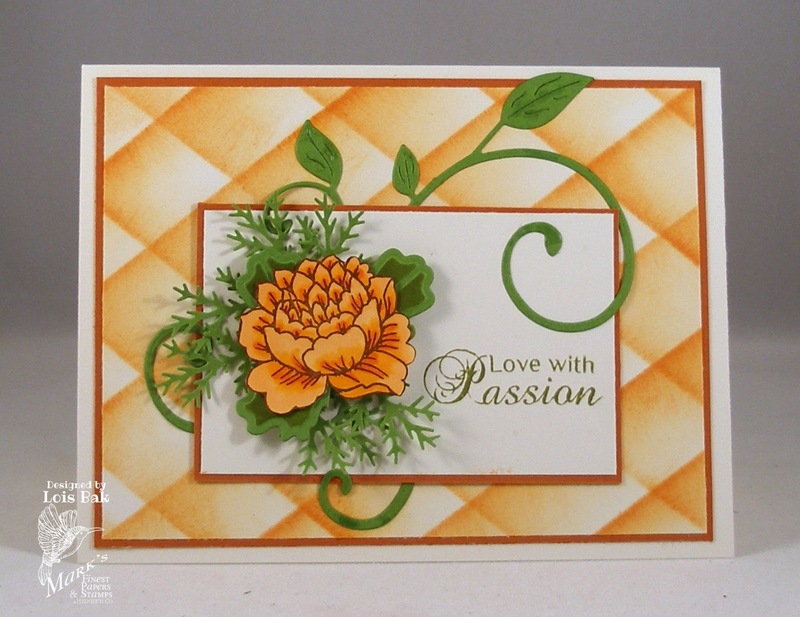 Check out the rest of the team over on the CCEE Stampers blog to see how they treated this layout. 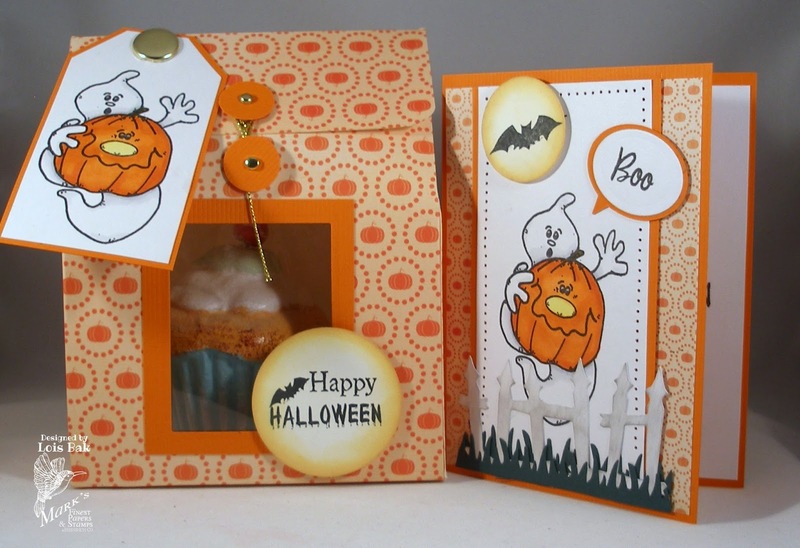 But, be sure to continue on with the MFP Blog Hop too! 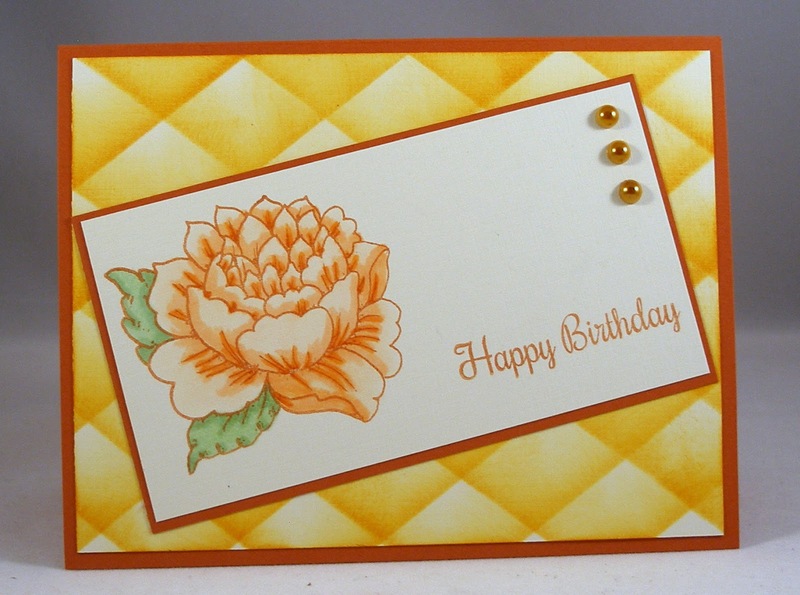 I'm not an official part of the blog hop today or tomorrow, but I made several cards using today's set. I'm glad you came by to check them out. 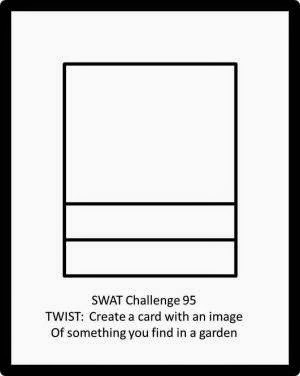 The Sketch Challenge with a Twist layout I used for my next card is SWAT 95. The twist was to use something you would find in a garden. I sure wish I had something like these tiger lilies in MY garden! This card is pretty clean and simple. I did pop up the middle panel and added some piercing around the edges, but other than that it went together quite quickly. The sketch for my first Tree Frogs card is SWAT 52. The twist was to use some black on your card. That was an easy one! 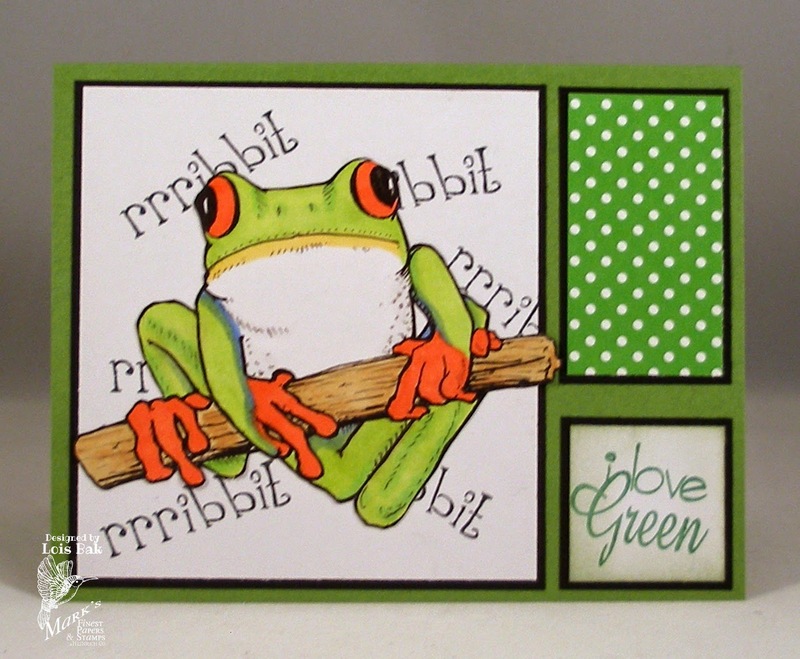 The tree frogs in this set are just too cute! I used the same polka dot paper on both of these cards. It just seemed to go with the frogs! 10 PM EST on Friday, May 16, 2014. 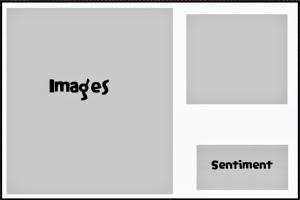 Continuing with my theme of Speedy TV Sketch Challenge with a Twist layouts, my first card today uses the layout from Sketch Challenge #47. The twist for this challenge was an outdoor theme. I may have been pushing the envelope with this one, but butterflies and flowers do grow/exist outdoors. 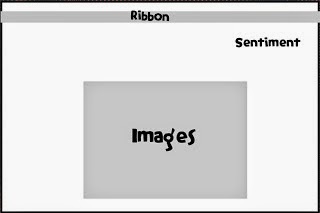 In addition, I rotated the layout and used a circle rather than a square for my focal image. 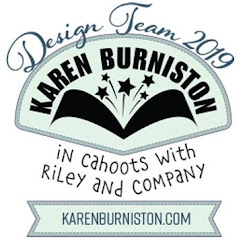 I used another Karen Burniston Pop It Ups accordion die for my second card. This time it is the Circle set. 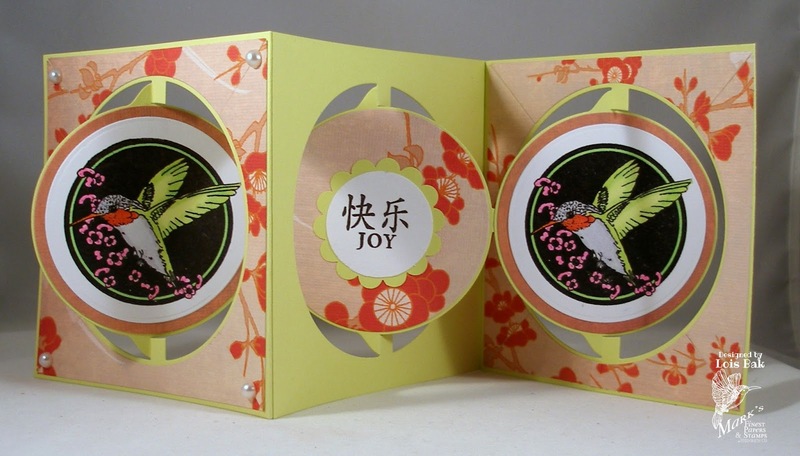 I had a DCWV Far East patterned paper pad, which has some very pretty oriental papers. I cut the frame using a coordinating die set and added some pearls at the corners. 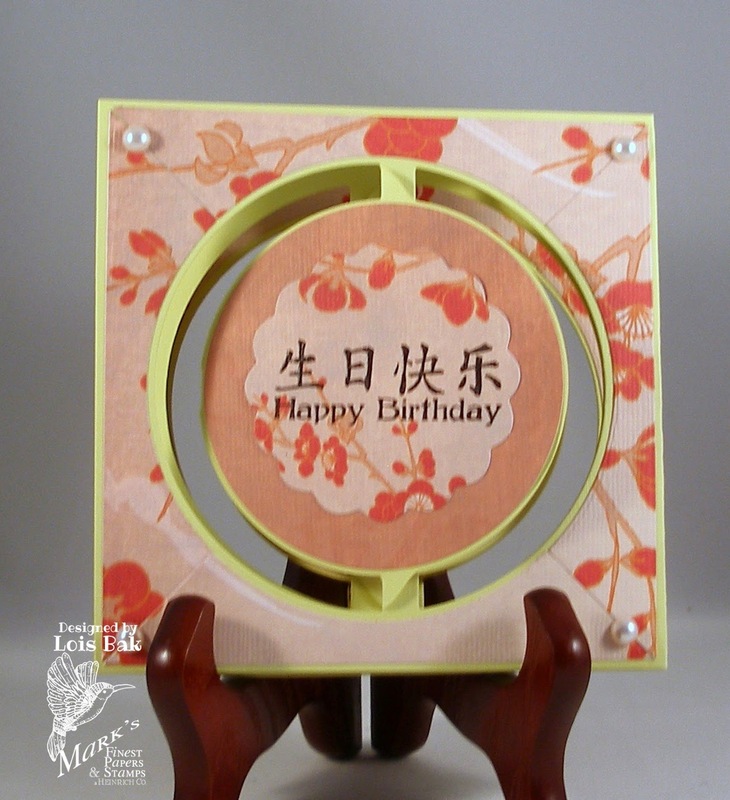 The birthday sentiment on the front is from another MFP oriental set, Branch of Blossoms. This is the card opened so you can see all three panels. CCEE 1419 - No Socks Day!